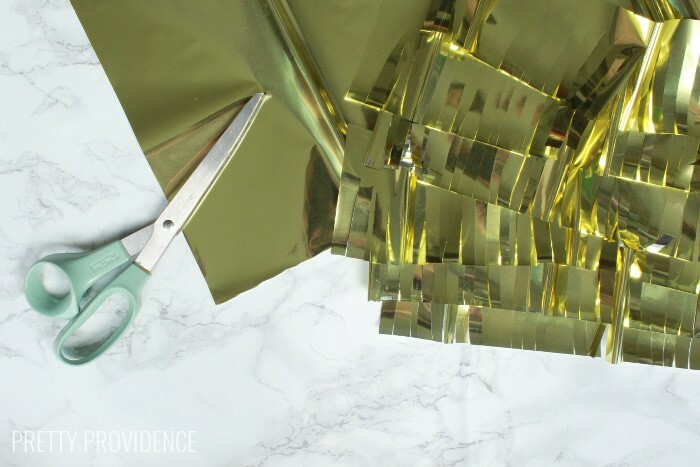 Hey friends, I’m Sarah from Pretty Providence, where my BFF Jess and I blog all of our best ideas for creating a beautiful home, eating well, having fun, and looking stylish without spending a lot of money! 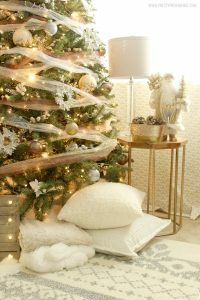 I love to decorate for Christmas but I can’t bring myself to spend a lot on pricy decor since it is only up for about a month. 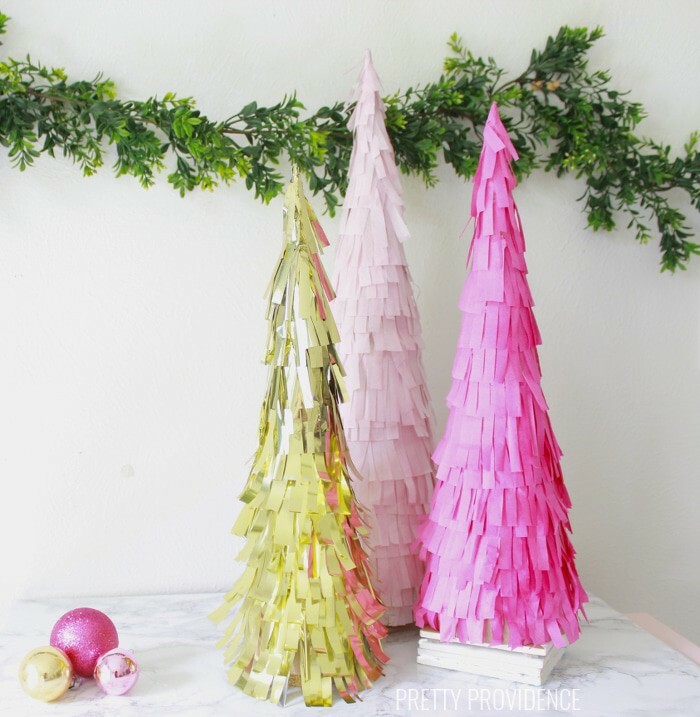 That’s why I love these DIY fringe trees I made! 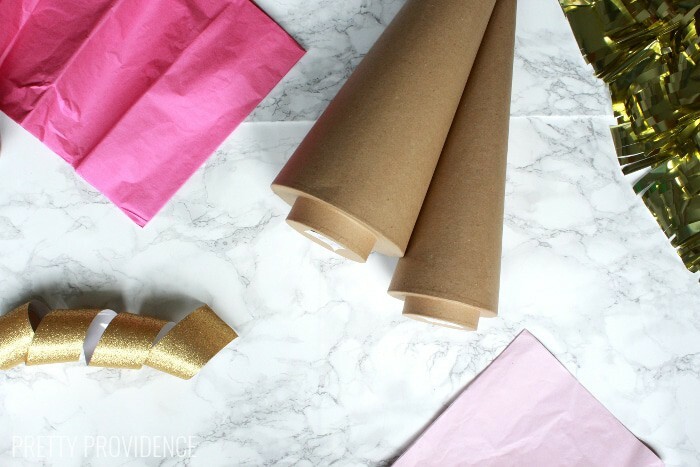 They cost next to nothing – $6 for the biggest cone and $3-$4 for the smaller ones plus tissue paper and mylar, which I already had, but only costs about $1 at the craft store! Here’s how to make your own. 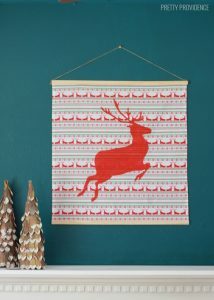 Start by cutting strips of tissue paper about three inches tall. You cut 7 or 8 sheets at a time by leaving them stacked (like they usually are straight out of the package.) Do the same with mylar if you are using that. 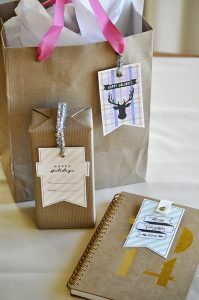 Fringe the tissue paper or mylar by cutting slits every 1/4 inch or so (thickness is personal preference) leaving about 1/2 inch of space untouched. 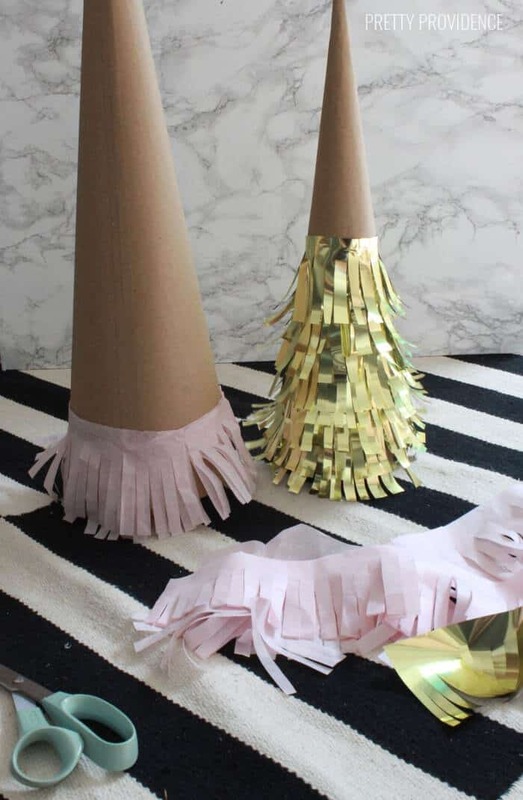 Use a glue gun to glue your fringe to the paper maché cone. Start at the bottom and add layers all the way up to the top. I added a new layer every 3/4 to 1 inch above them, so that by the end it was a thick fringe. Again, however you want to do this is personal preference! You are done! So easy, right? I added some glitter tape to the tree stems but you honestly can’t see it. That is an option, though if you leave your fringe shorter at the bottom. 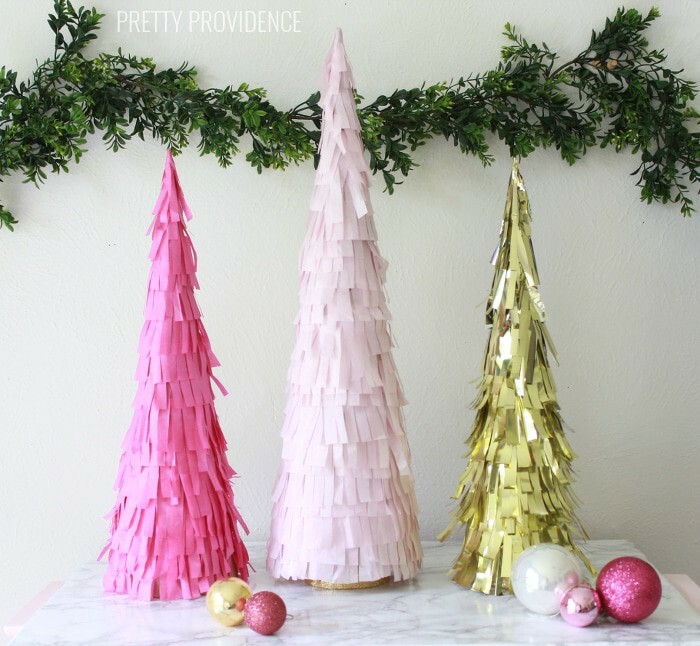 Make sure to stop by Pretty Providence to see what else we are cooking up for the holidays! Thank you SO much for sharing Sarah (and Jess!!) Miss you girls! 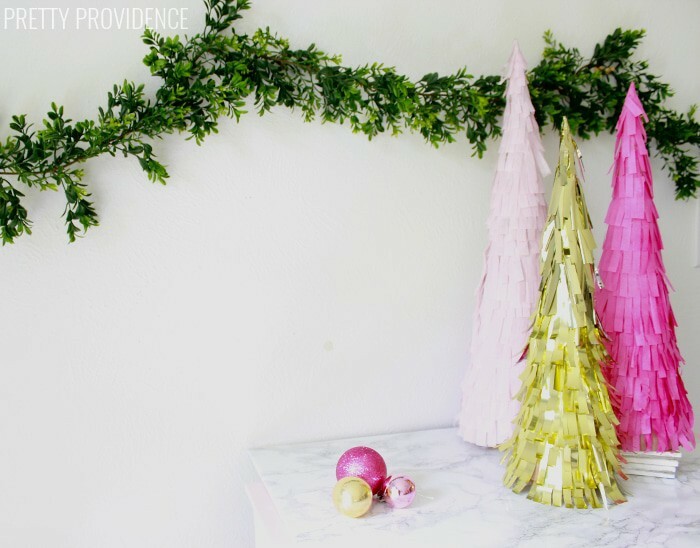 We are dying over the pink and gold foily goodness! This is perfection! Be sure to follow both Sarah and Jessica on their blog, Pretty Providence and on Instagram, Facebook and Pinterest!